Yesterday was not the best day ever. I forced myself out of bed early to ride, and I was mounted by 7:10 am. It was 32 degrees, foggy, a crisp and damp morning. I had to be at work by 8:00 am (5 minutes away), so I only intended to do a mile. Tristan had already had his grain maybe 15 minutes previously; he was nibbling on his hay when I got there. He hadn’t finished his grain, but had left the scrids of it mixed in with his supplements. Not totally out of the ordinary for him. There was a thick frost on the grass and I wore my winter tall boots. We went a mile in 19 minutes, just on the flattest of dirt roads and then on a loop up and around the outdoor. My goal right now is to just keep him moving for 20 minutes a day as my bare minimum. Most days we do far more than that, but today I just wanted to sneak in a quick ride before morning meetings and then have the afternoon at home to do some much needed cleaning & relaxing. I put him back in his stall and pulled his saddle, He nosed his hay, and then pawed at it, and I could feel my stomach start to knot up. He pawed again. He circled his stall. Then he kicked at his belly with a hind leg, then the other hind leg, then he circled his stall. The bottom dropped out of my stomach. I listened for gut sounds – quiet, but present. Under my hands as I was listening, I could actually feel him start to tuck up, feel those hard stomach muscles clench, and when I stepped back he had clamped his tail down tightly. I went to the other barn and found the trainer’s barn manager, M., and asked her to come look at him when she got back from turning out the horse she was holding. When I got back to his stall, his flanks had started shivering. This was maybe 10 minutes elapsed time after I’d put him back in his stall. I pulled him out and brought him in to the aisle and started pulling blankets off shelves. He ended up with an Irish knit, a wool cooler, and then a midweight on top of that, none of which were his or even close to his size. Under the blankets, he started full body shivering, and I reached for my phone. The barn manager got back just as I started dialing for the vet, and while on the phone with her we took his temp – 97.9 – and tried to get a pulse. He’s tricky to pulse at the best of times, and I fumbled the stethoscope repeatedly before handing it over to the barn manager, who couldn’t get a good read either. I would get 3-4 beats and then lose it. It was clearly a little fast, but I couldn’t put a number on it. Vet and I decided to go ahead with IV banamine, and I told her I’d check in in 30 minutes. While I was on the phone with her he started visibly relaxing and his shivering slowed, even before he’d had the banamine. It eased up even more, and then he got 8ccs of banamine IV. I started walking him – he’d never shown any real inclination to go down, but it gave me something to do. In another 5 minutes, he had totally stopped his shivering and was looking around and considerably perked up. I walked him for another 5 minutes, and then brought him back to his stall. He attacked his hay and cleaned up his grain, and then I removed his hay from his stall. He was pretty ticked about that, but then took a good long drink and peed up a storm. He hunted around for the last little scraps of hay and started kicking his door to be let out. I went into storage and dug out his fleece cooler and turnout sheet, and pulled the borrowed blankets off him to swap for his own. He looked and acted 100% normal at that point, barely 45 minutes after the whole thing started. I went into the tack room to brief our barn manager (main barn and trainer’s barn have different BMs; sounds confusing but actually works just fine, since trainer’s BM goes south with her for winter). A few minutes of conversation and we had fleshed out what the vet and I had thought: he got too cold. Many Cushings horses lose the ability to regulate their own body temperature. I knew this, and was watching him like a hawk in the summer, but he handled the really hot days just fine. It did not for a single second occur to me that cold might affect him more than heat. 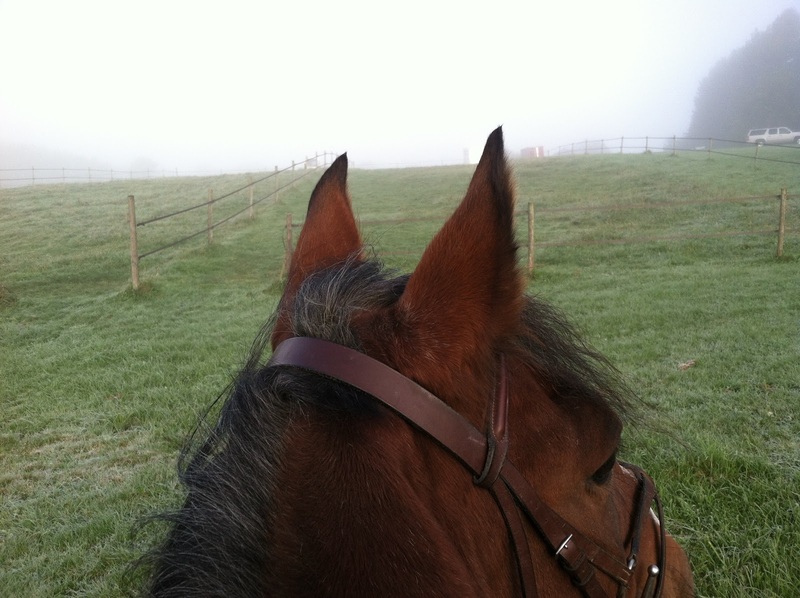 In any case, it wasn’t really all that cold – it must have been high 20s at the barn overnight. That’s chilly, but it’s not downright cold, not relative to what it will be in January and February. I left him to go to staff meeting, and when I got back he had been turned out in one of the round pens, which functions as a dry lot. He’s just to the left of the tree, in the light blue sheet. I checked in with him and he was happy and relaxed and just fine, nibbling on the hay bits on the ground. 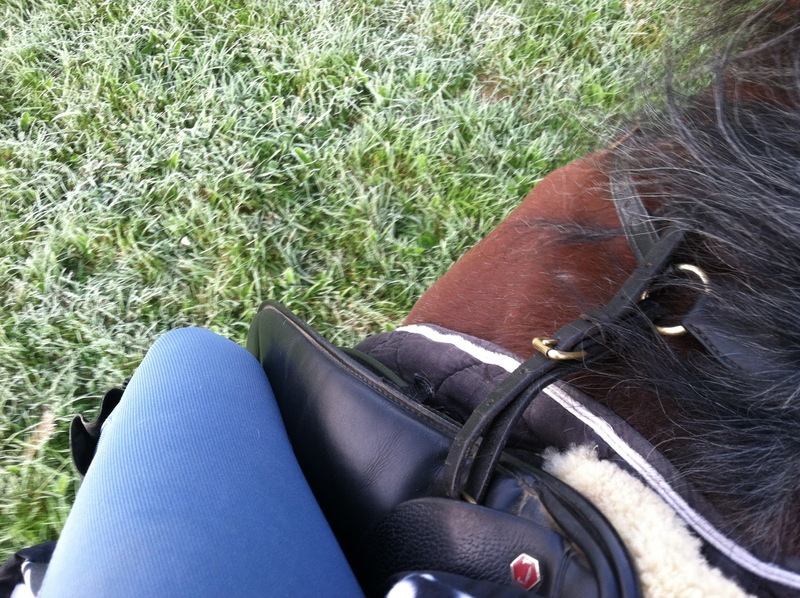 He was wearing the fleece cooler + turnout sheet (no lining) and it was about 45 degrees and sunny. I felt underneath the blanket and he felt cozy and warm – not too warm. If you’d told me this time last year that my horse would be wearing layers in 45 degree weather, and not sweating up a storm, I would’ve said you were crazy. I put out a call on Facebook for some blankets, and as it turns out a good friend of mine – who was already planning on coming to give Tristan a massage tonight – has some that she’ll bring. We’ll go through what she has, and I’ll see what gaps I still need to fill. I had a long conversation with the Smartpak customer service rep this morning and picked out a range of blankets that I will order tonight after seeing what J. brings. Previous Post Road ID or RoadSafe? scary. glad he's ok and that it wasn't more serious. Glad to hear he is feeling better!! Good luck blanket shopping! Hang in there! Having a Cushing's horse can be overwhelming at times. We purchased my daughter's pony knowing she had Cushings (in fact, we diagnosed her–the previous owner had no idea!). We had many enjoyable years with this pony. As she got older she had difficulty with large temperature swings, both in the fall and spring. 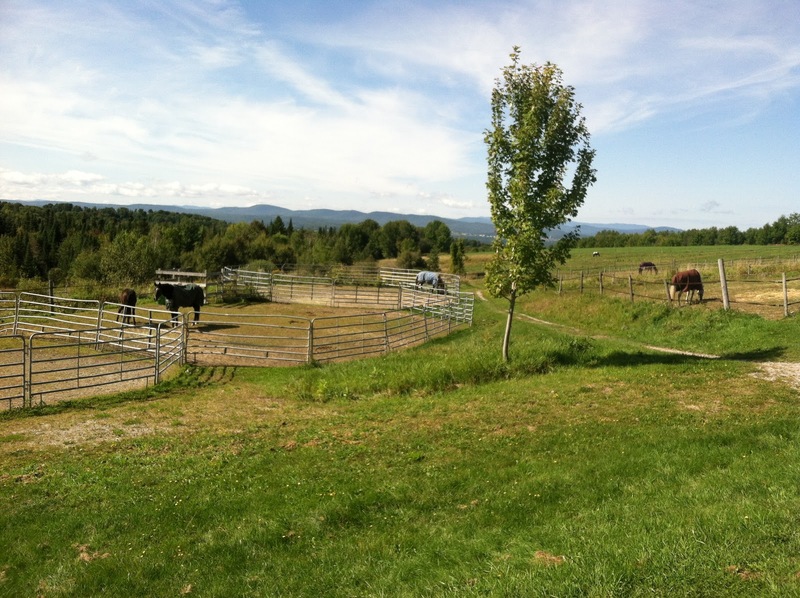 We live in the same area as you (but in NH) and the large drop in temperature on Sunday night in temperature would have brought about colic symptoms. I didn't find that she was especially sensitive to heat or cold but to the large swings in temperatures. Unfortunately I didn't find a solution to this issue and could only offer supportive measures. Her reactions to temperature change did get more severe over time. The worst for her was always in the spring when we had a warm up followed a cold snap and windy conditions. So, what I mainly wanted to say was to not go overboard buying blankets yet. Watch to see if his reaction is to temperature changes, not just to the cold. Yikes. Sounds scary. Glad he's alright. Oh, that's an interesting thought. The temperature swings have been wicked, especially the last few days. It's funny, he did just fine with the ones over the summer – when it got so hot for a couple of days, etc. It took the cold snap to bring this on. I'll have to think about that. Part of me (the part that comes from a whole family of Eagle Scouts) wants to buy the blankets and have them and be ready. But the Yankee practical side of me sees your wisdom! Dear Tristan, Quit giving your mom heart attacks. Kthnxbye. What a frightening morning. I'm glad he was okay, and I'm glad you were there to catch this in time. You are a fantastic horse mom and Tris is very lucky to have you!